In the field of home automation, there are few firms that can approach Leviton’s record as an industry leader and innovator. Since its founding in 1985, the New Orleans-based company has won more 100 awards for its products and high quality automation solutions. Leviton’s extensive inventory of hardware and software tools has been used to solve the most complex challenges in the residential automation of lights, audio, heating, cooling, ventilation and security. The ever-expanding line of Leviton’s products is not limited simply to home automation, however. The company has developed a powerful approach to automation that can also master the demanding requirements of just about any commercial installation. In addition to the high-level technical quality of Leviton products, they also enjoy another advantage: Installers can deploy Leviton systems quickly with virtually no callbacks. The following case study of an Leviton installation in a large, multi-building plant nursery in Ontario is just one example of how Leviton is the right choice for large scale commercial automation. The Richmond Nursery in Richmond, Ontario, is an eight-acre site that encompasses more than 15 gutter connected greenhouses. Altogether, the site has one full acre under glass. The nursery grows a wide variety of products, from mums and poinsettias to rabbit’s foot ferns and begonias. At any one time the facility will have more than 1,000,000 plants of up to 1,000 different types under cultivation. 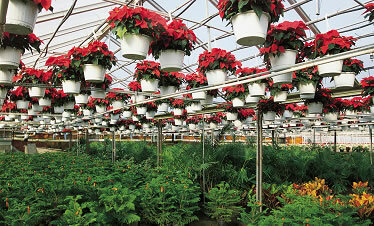 During the holiday season, the nursery can have 14,000 poinsettias growing in the greenhouses. All of those plants need regular watering, light and climate control. And given the wide variety of plants being grown at the facility, the nursery’s needs were complex – a simple, “one size fits all” care program would not work to reduce costs. For example, the nursery had previously used simple timers for controlling lighting. According to Peter Rofner, general manager of the Richmond Nursery, this solution needed constant adjustment as the hours of daylight changed during the year. If the timers were set early in the spring, the lengthening hours of daylight could lead to situations in which lights were still on even after sunrise. “We sometimes had situations where we were paying for two hours of lighting when it was unnecessary,” Rofner said. With such large-scale, complex operations, the nursery needed a way to better control its site and reduce substantial electricity and heating expenses. The Richmond Nursery was spending approximately $6,000 (Canadian) a month on electrical service and $4,000 (Can.) a month on natural gas heating. The plant nursery’s owners wanted a way to cut these costs and gain better control over the facility’s energy consumption. They also wished to improve control over lighting and increase security. And they wanted to do this with an integrated automation system. Peter Rofner and the Richmond Nursery turned to Louis Levetsovitis, owner of and chief installer for Natural Automation in Greely, Ontario. Levetsovitis is an Leviton certified installer. Levetsovitis surveyed The Richmond Nursery’s needs and met with and listened to the nursery’s management group about the type of system they wanted. He put together a package of Leviton components to address the nursery’s particular challenges. Another tricky aspect of the installation was adjusting the watering rate based on the relationship between outside and inside temperature. “When it’s 70° to 80° F outside, it’s 110° F in the greenhouses,” Levetsovitis said. “At that inside temperature, it takes so many more gallons to properly water the plants. For example, at 110° we might need 60 gallons per minute.” And these parameters change with the seasons and the plant species. When it’s cold outside at Christmas time, the nursery raises poinsettias. In the warmth of late spring, a major product is tomato plants. Similar to the watering requirements, ventilation rates and lighting amounts also required fine tuning to season and plant species. The Leviton system has drastically reduced the electrical and natural gas expenses for the business. The Richmond Nursery’s electrical expense was halved from $6,000 Canadian per month to $3,000, and gas expense was reduced from $4,000 to $2,500. These monthly energy savings equate to yearly savings of $36,000 for electricity and $18,000 for natural gas. In addition to these savings, managing director Rofner also has a complete, integrated system that provides him with detailed data on the operation of his business. And he knows that, with the Leviton automation system now in place, as conditions, seasons, and plant species change, the system will automatically adjust and optimize the nursery’s systems for water, ventilation, heat and CO2. The Leviton advantage can be summed up in two words: power and flexibility. Leviton has long supported a variety of open protocols for system integration. According to Greg Rhoades, Leviton director of marketing, this capability allows Leviton systems to be the central processing unit of the system and work with outside gear. “One of our strong points is to be the brain to tie together third party products,” Rhoades said. Leviton, the longtime leader in home automation, has systems and equipment that can handle much more than just residential systems. As shown by the installation at the Richmond Nursery above, Leviton automation has all the capabilities to handle challenging and complex commercial installations. Leviton products give dealers and installers great flexibility to speedily create effective and reliable systems for their customers. Leviton allows dealers to write interfaces that control everything from lighting modules to incorporating iPads. Installers can add simple tweaks to systems or they can build something new and client specific. “We allow dealers to make interfaces that will work with just about anything,” Rhoades said. Leviton is not just a home automation company, but can handle complex commercial installations like the Richmond Nursery. Installers know Leviton products will work out of the box and that reliability will greatly reduce callbacks.